Reflections and Lessons: #NeverForget is the hashtag – but have we? 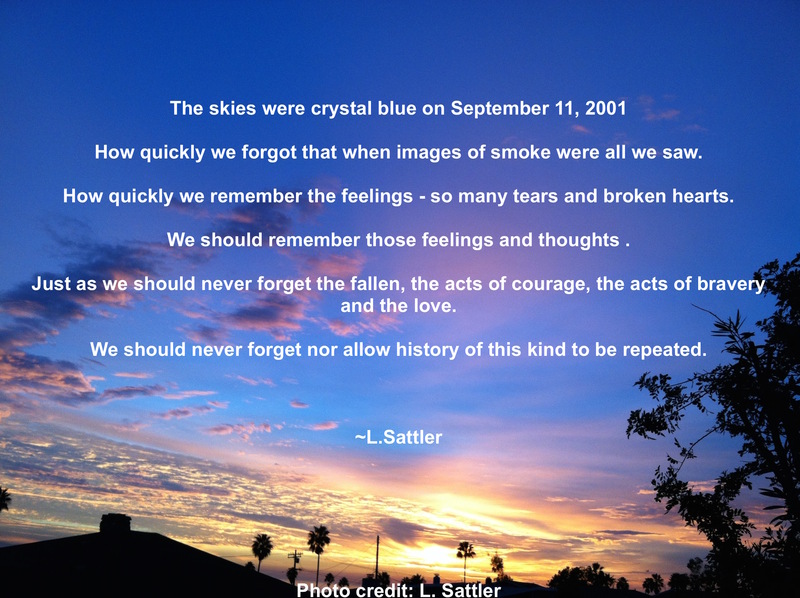 I write this with a heart that is still so heavy with sadness for those who have lost their loved ones as a result of the terrorist acts on September 11th. Yet, I wonder if others are thinking of today more as “football Sunday” vs. a day of remembrance? Have we forgotten about how we all promised to “come together”, “help each other” and #NeverForget the lessons of September 11, 2001? As the collateral damage still unfolds as those continue to die – even indirectly. We forget that many brave people (and animals) risked their lives trying to help others. Our First Responders worked tirelessly to help find survivors. Many of those are suffering from Post -traumatic stress disorder and ill health – even 15 years later. And, directly due to 9/11 we lost scores of brave men and women in combat. Lives forever gone and families forever heartbroken. Also, as an oddity to many we have hit a juncture where there are now college aged people who have only a “faint memory” of the events that unfolded on September 11, 2001. Their only recollection are the stories passed down to them from those who “remember when…” or memories of media images they saw when young. Some are even saying that 9/11 is now more “historical” than “relevant” news. How can the events of September 11th be “historical” when for many it still feels like yesterday? … there is another observation I have made and feel compelled to write about – one that hits me in the pit of my stomach. We are making making of the same mistakes – again! We have not learned the lessons of our ancestors or even one generation ago. We are in a place that may be all too familiar for those who experienced the Holocaust or Cold War. Our educational curve is going downward instead of upward when it comes to learning from the past about how minds can be “twisted” during times of economic and emotional turmoil. Adolph Hitler banked on people wanting – needing – more and different. He placed blame on niche groups. This scenario is happening again- NOW – like a Greek tragedy only with different people at the helm. Sadly, many are forgetting. We aren’t living up to the pledges and promises we made on the days, weeks and months following Sept 11th. In social media “hashtag” terms our ability to honor the fallen and learn from the past may seem like we will #NeverForget but in many ways the reality is we are leaning towards an #EpicFail, as too many are still suffering and we are not as cohesive a nation or world as we once had promised, had hoped. In my humble opinion, we must honor all who lost their lives and those we still grieve as a result of September 11th by being POSITIVE agents of change. So please, make a difference so that our children and children’s children have half a chance to live a life in the land of free because we remember the brave.